An intersection is an at-grade junction where two or more roads meet or cross. 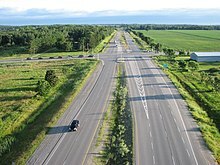 Intersections may be classified by number of road segments, traffic controls, and/or lane design. A three-way intersection is a junction between three road segments (arms): a T junction when two arms form one road, or a Y junction – the latter also known as a fork if approached from the stem of the Y. A four-way intersection, or crossroads, usually involves a crossing over of two streets or roads. In areas where there are blocks and in some other cases, the crossing streets or roads are perpendicular to each other. However, two roads may cross at a different angle. In a few cases, the junction of two road segments may be offset from each when reaching an intersection, even though both ends may be considered the same street. Five-way intersections are less common but still exist, especially in urban areas with non-rectangular blocks. An example of this is the intersection for which the Five Points district in Atlanta is named. Six-way intersections usually involve a crossing of three streets at one junction; for example, a crossing of two perpendicular streets and a diagonal street is a rather common type of 6-way intersection. Seven or more approaches to a single intersection, such as at Seven Dials, London, are rare. Uncontrolled intersections, without signs or signals (or sometimes with a warning sign). Priority (right-of-way) rules may vary by country: on a 4-way intersection traffic from the right often has priority; on a 3-way intersection either traffic from the right has priority again, or traffic on the continuing road. For traffic coming from the same or opposite direction, that which goes straight has priority over that which turns off. Yield-controlled intersections may or may not have specific "YIELD" signs (known as "GIVE WAY" signs in some countries). Stop-controlled intersections have one or more "STOP" signs. Two-way stops are common, while some countries also employ four-way stops. Signal-controlled intersections depend on traffic signals, usually electric, which indicate which traffic is allowed to proceed at any particular time. A traffic circle is a type of intersection at which traffic streams are directed around a circle. Types of traffic circles include roundabouts, 'mini-roundabouts', 'rotaries', "STOP"-controlled circles, and signal-controlled circles. Some people consider roundabouts to be a distinct type of intersection from traffic circles (with the distinction based on certain differences in size and engineering). A box junction can be added to an intersection, generally prohibiting entry to the intersection unless the exit is clear. Some (unconventional or alternative) intersections employ indirect left turns to increase capacity and reduce delays. The Michigan left combines a right turn and a U-turn. Jughandle lefts diverge to the right, then curve to the left, converting a left turn to a crossing maneuver, similar to throughabouts. These techniques are generally used in conjunction with signal-controlled intersections, although they may also be used at stop-controlled intersections. At intersections, turns are usually allowed, but are often regulated to avoid interference with other traffic. Certain turns may be not allowed or may be limited by regulatory signs or signals, particularly those that cross oncoming traffic. Alternative designs often attempt to reduce or eliminate such potential conflicts. At intersections with large proportions of turning traffic, turn lanes (also known as turn bays) may be provided. For example, in the intersection shown in the diagram, left turn lanes are present in the right-left street. Turn lanes allow vehicles to cross oncoming traffic (i.e., a left turn in right-side driving countries, or a right turn in left-side driving countries), or to exit a road without crossing traffic (i.e., a right turn in right-side driving countries, or a left turn in left-side driving countries). Absence of a turn lane does not normally indicate a prohibition of turns in that direction. Instead, traffic control signs are used to prohibit specific turns. Turn lanes can increase the capacity of an intersection and/or improve safety. Turn lanes can have a dramatic effect on the safety of a junction. In rural areas, crash frequency can be reduced by up to 48% if left turn lanes are provided on both main-road approaches at stop-controlled intersections. At signalized intersections, crashes can be reduced by 33%. Results are slightly lower in urban areas. Turn lanes are marked with an arrow bending into the direction of the turn which is to be made from that lane. Multi-headed arrows indicate that vehicle drivers may travel in any one of the directions pointed to by an arrow. Traffic signals facing vehicles in turn lanes often have arrow-shaped indications. Green arrows indicate protected turn phases, when vehicles may turn unhindered by oncoming traffic. Red arrows may be displayed to prohibit turns in that direction. Red arrows may be displayed along with a circular green indication to show that turns in the direction of the arrow are prohibited, but other movements are allowed. In some jurisdictions, a red arrow prohibits a turn on red. Disadvantages to turn lanes include increased pavement area, with associated increases in construction and maintenance costs, as well as increased amounts of stormwater runoff. They also increase the distance over which pedestrians crossing the street are exposed to vehicle traffic. If a turn lane has a separate signal phase, it often increases the delay experienced by oncoming through traffic. Without a separate phase, left crossing traffic does not get the full safety benefit of the turn lane. Alternative intersection configurations can manage turning traffic to increase safety and intersection throughput. These include the Michigan left, "superstreet" and continuous flow intersection. Diagram of an example intersection of two-way streets as seen from above (traffic flows on the right side of the road). The East-West street has left turn lanes from both directions, but the North-South street does not have left turn lanes at this intersection. The East-West street traffic lights also have green left turn arrows to show when unhindered left turns can be made. Some possible markings for crosswalks are shown as examples. Intersections generally must manage pedestrian as well as vehicle traffic. Pedestrian aids include crosswalks, pedestrian-directed traffic signals ("walk light") and over/underpasses. Walk lights may be accompanied by audio signals to aid the visually impaired. Medians can offer pedestrian islands, allowing pedestrians to divide their crossings into a separate segment for each traffic direction, possibly with a separate signal for each. Some intersections display red lights in a all directions for a period of time. Known as a pedestrian scramble, this type of vehicle all-way stop allows pedestrians to cross safely in any direction, including diagonally. All green for non motorists is known from the crossing at Shibuya Station, Tokyo. Protected intersection design based on a common Dutch model, preserving the physical segregation of the cycle lane throughout the intersection. A number of features make this protected intersection much safer. A corner refuge island, a setback crossing of the pedestrians and cyclists, generally between 1.5–7 metres of setback, a forward stop bar, which allows cyclists to stop for a traffic light well ahead of motor traffic who must stop behind the crosswalk. Separate signal staging or at least an advance green for cyclists and pedestrians is used to give cyclists and pedestrians no conflicts or a head start over traffic. The design makes a right turn on red, and sometimes left on red depending on the geometry of the intersection in question, possible in many cases, often without stopping. Cyclists ideally have a protected bike lane on the approach to the intersection, separated by a concrete median with splay kerbs if possible, and have a protected bike lane width of at least 2 metres if possible (one way). In the Netherlands, most one way cycle paths are at least 2.5 metres wide. Intersections can be made more bicycle-friendly with various interventions such as protected intersections or grade separation. A low grade alternative is a bike box in terms of safety. ^ Steyn, Hermanus. (2014). Displaced Left-turn Intersection Informational Guide. Washington, D.C.: U.S. Department of Transportation, Federal Highway Administration. ^ "Manual on Uniform Traffic Control Devices (MUTCD), Part 1" (PDF). U.S. DOT, Federal Highway Administration. December 11, 2009. Retrieved November 28, 2011. ^ New York State Driver's Manual, Chapter 4. ^ Badger, Emily. "Could These Crazy Intersections Make Us Safer?". The Atlantic Cities. Atlantic Media Company. Retrieved 29 January 2013. ^ "Saturday afternoon at Shibuya Crossing, Tokyo". April 21, 2007. ^ Falbo, Nick. "Protected Intersections for Bicyclists" (PDF). Protected Intersection. ^ "How wide is a Dutch cycle path?". Bicycle Dutch. 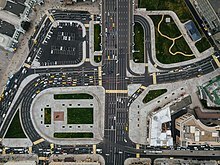 Wikimedia Commons has media related to Road junctions. This page was last edited on 1 April 2019, at 02:46 (UTC).